Summer is already in full swing here and clearly my brain is on break, because I totally forgot to post this month’s meal plan! Our days have been filled with kids playing outside, paddle boarding, and afternoons at the pool. So I like to have something pre-planned so that I don’t have to think much about meals don’t you? 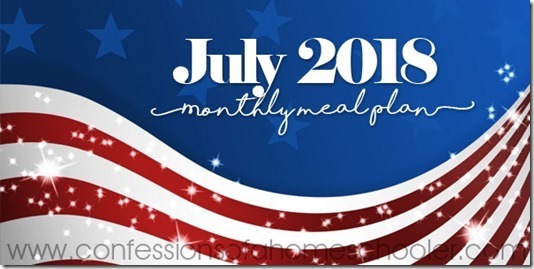 So without further ado…download my July 2018 Monthly Meal Plan and get to enjoying the warm weather! 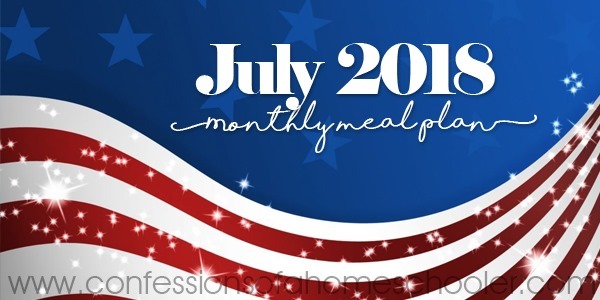 My monthly meal plans include breakfast, lunch, dinner and snack ideas for every day in the month! For more fun recipes, visit my Recipes Page! If you haven’t already used this before, you can click on any of the underlined menu items to get to the recipe. I like to shop once a week, so I just make a list off of my menu plan and head to the store. I find that I spend less when I shop off of a list, then flying by the seat of my pants. I also end up with ingredients that will actually go together instead of a bunch of random items that don’t amount to anything. Also, feel free to modify these menus to fit your needs, if you know you’ll have leftovers, than maybe skip one or two of the meals. It’ll save you time and money! Busy Mom’s Guide to Home-cooked Meals Do you wish there was something that included monthly meal plans, recipes, grocery shopping lists, as well as a customizable meal plan to fit your families needs? Look no further! 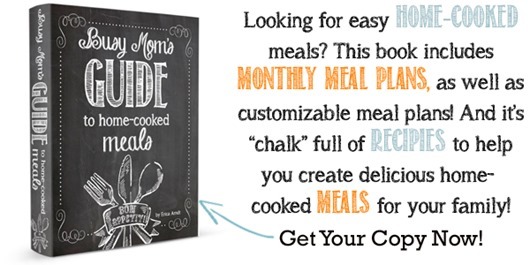 Check out my Busy Mom’s Guide to Home-cooked Meals! Details: This book is available as an 8.5×11 PDF download that you can print and have spiral bound. As well as a Paperback full color hard copy on Amazon. This book has 99 pages. I suggest printing in color, then spiral binding it at a local office supply store. Click below to get your copy today! Yay! Thank you for sharing! I started using your meal plans with June. Your recipes have been a hit with my family! Thank you for sharing! I started using your meal plans with June. Your recipes have been a hit with my family!